The Huh? : Nintendo: Another Limited Edition 3DS XL??? Nintendo is already outdoing itself with new and interesting ways to continually focus on selling us the same systems over and over. Why produce new games that may actually keep the customers that already own 5 variations of the same system when you can sell them another slightly different "Limited Edition" version of the same other 5 they have. 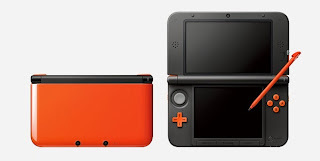 That being said- Nintendo Japan announced 2 new color variations of the 3DS XL- Turquoise/Black and Orange/black. They'll be available in Japan on Nov. 28th for ¥19,900 (That's just over $200). I do have to admit, I really enjoy the look of the turquoise. So once again, Nintendo is providing a tremendous variety of system variations on which we can play a relatively small assortment of games. I'm quite curious to know if the variety of 3DSs has surpassed the number of actual games available. It's got to be pretty damn close to passing the amount of games for the Wii U already.